On Wednesday 22 April 2015, I had the privilege to grade two of our dojo founding members, Peter and Jeremy, to 1st kyu (brown belt) in Aikido Yuishinkai. The event was made extra special by our Chief Instructor, Peter Kelly Sensei, also attending and afterwards giving an informal “by request” format class. 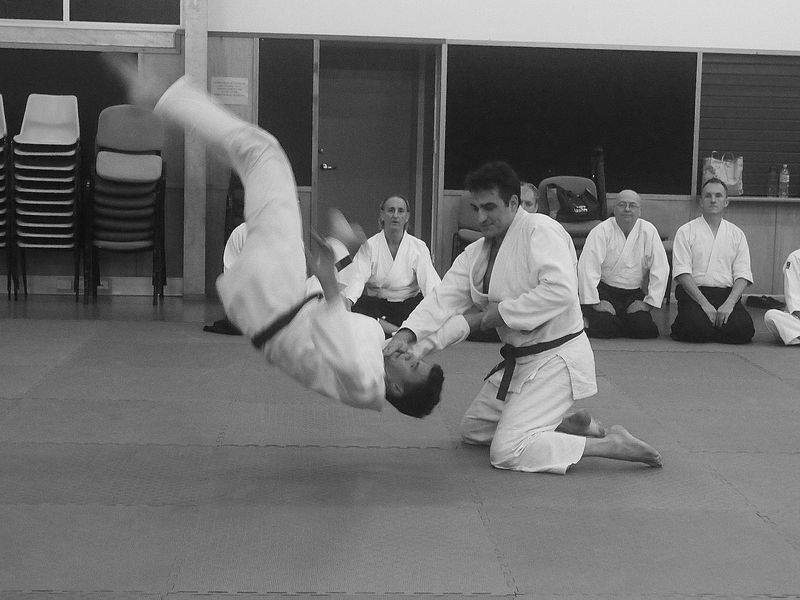 A major emphasis in our dojo (and Aikido Yuishinkai Australia generally) over the last 18 months is that development of technical and internal art skills is contingent upon our ukemi skills continuing to develop along with them at the same rate. With this in mind, Peter and Jeremy not only demonstrated the necessary techniques in taninzugake (free form) practice to fulfil their promotion requirements but also demonstrated they could readily receive them as well. I think it would be fair to say that the high quality of their ukemi was very much on display and did them both proud. By way of more general comment, Peter and Jeremy are two of the most committed aikido practitioners I have ever met and very much embrace the training spirit that underpins Aikido practice. They are more than deserving of the hakamas they now wear and congratulations to them both. For those not familiar with this style of class, essentially it involves Peter Sensei giving instruction and assistance with techniques in response to queries raised by the students on the mat. Unlike last year’s similar class where koshinage and ikkyo were the focus, this year it was kaite nage (“wheel throw”) and shiho nage (4 direction throw) applications which inspired the questions. Irimi nage (entering throw) and kokyu nage (breath throw) were also explored. Key training tips and links to relevant video extracts from the class can be found below. Katatedori kokyu nage (zenpo nage) – video link. As we often do at our dojo when an event occurs, we cobble together the best of our photos and video, to put together a visual memento of the occasion for our dojo record books. A big thank you to Peter Sensei for visiting our dojo and our friends from Griffith Aikido Institute for supporting our grading and joining us in our Wednesday class. It was also great to have family and friends of Jeremy and Peter over to visit the dojo and join us for the gradings. Last but certainly not least, a personal thanks to our dojo members for not only giving their all as ukes and nages on the night, but for making our dojo such a great place to train every other night as well. Thumbs up also to our wonderful admin team (Desiree, Eden and Darcy) who keep the dojo cooking behind the scenes.